Once again we walked into the bazaar on Sunday. It takes about 3-1/4 hours round-trip, going to the top of Kulri where the bookshops are located. We had a number of stops this time -- Broadway Optical to pick up my new glasses (they are great! and this time the lenses are on the correct eyes); Chandar Book Depot to get the newspaper and weekly magazine; Nirula's for ice cream; Ram Chander for a few groceries; Parshadi Lal for some medicines; the dairy for dahi; and last, the subzi wallah below the hospital. He thinks it's quite funny that we only get a couple of onions. This time I got the other veggies I wrote about yesterday, but he still thought it wasn't enough. We thought the name of this shop in Kulri, opposite the Police Station, was interesting. 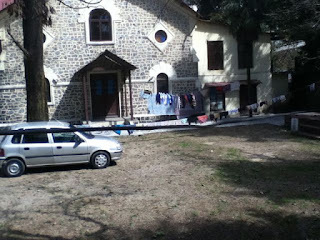 This is the back side of the Kulri Methodist Church. I don't know if anyone lives in the building, but there was lots of laundry hanging on lines in the courtyard. The following picture was taken on Mullingar Hill as I was walking up. The green vehicle in the back is a sort of pickup that Khaliq's shop is working on. The road is basically one lane, so having three vehicles across is fairly tight! I was standing in the doorway of a shop. 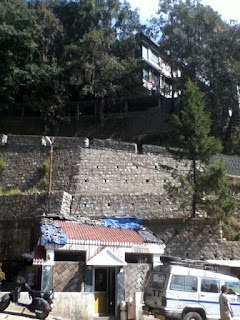 This is a view of Landour Community Hospital from Tehri Road. A couple of years ago I posted some photos of the huge retaining wall being built. 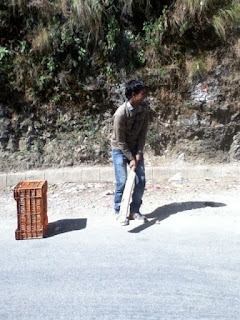 In the middle of the road near the hospital, a common sight: boys playing cricket with whatever they have at hand. They did have a proper bat. The plastic crate stands in for a wicket. 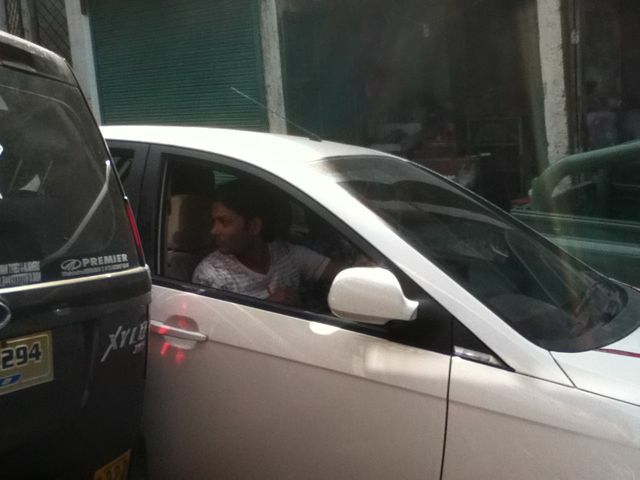 While we were walking by, this young man hit the ball high and it landed somewhere above on the khud. Two small boys immediately started climbing up to retrieve it. 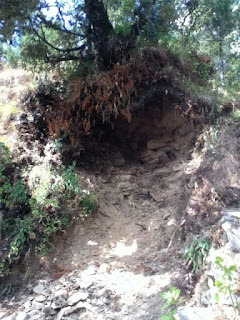 This landslide from the monsoon wasn't as big as the one I posted last week. But it certainly undermined this tree, that will probably come down next year. 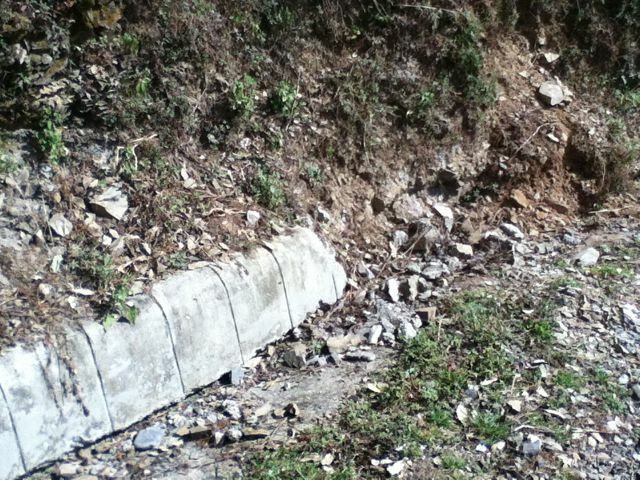 Last spring we watched many improvements being made on Tehri Road. The new paving is mostly still intact, with some rough areas. 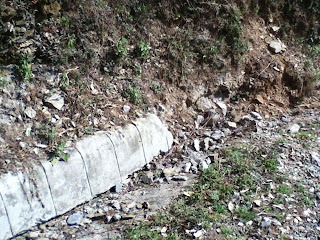 The beautiful gutters, however, didn't make it through the monsoon all that well!